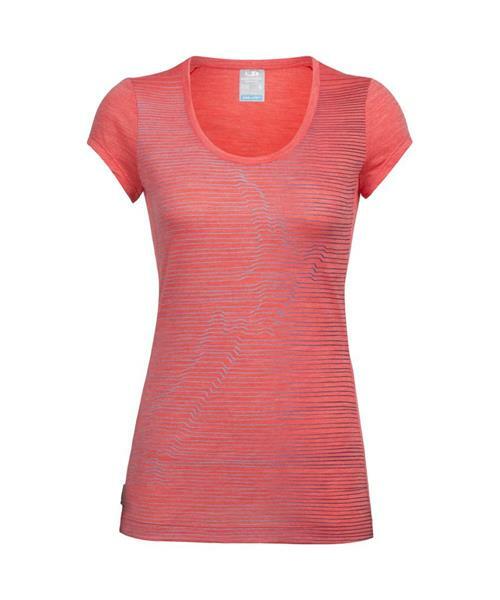 A modern daily merino wool T-shirt that packs as much flattering style as it does soft comfort, the Sphere Short Sleeve Scoop Cool Relief is a summertime wardrobe staple. Icebreaker's Cool-Lite™ jersey fabric blends natural Tencel® with their corespun fibers—nylon threads wrapped in merino wool for the ultimate combination of softness, breathability and durability. The deep feminine scoop neck, cap-sleeve construction and original artwork by Stu Forsyth provide total warm-weather comfort with a versatile look. * Center back length: 69.3cm/27¼"
Sphere SS Scoop - Cool Relief - Womens is rated 4.8 out of 5 by 10. Rated 5 out of 5 by Namaste from cool-lite short sleeve T amazing fit...glad i ordered small. I like the length and flattering style. I also like the spectrum of colors in all their apparel. Just love Merino :) I can not buy anything else as comfortable, warm and stylish...that is for any type of sports or at work. Amazing how you can stay connected to NATURE! Rated 5 out of 5 by Biophile from Comfort Fit I have been wearing Icebreaker for more than 15 years. Its products continue to impress me. Excellent fit, comfortable feel and cool design. Great for both outdoor activities and urban life. Highly recommended. Rated 5 out of 5 by BellaCiclista from this is my 2nd! I bought my first shirt a couple of months ago for a vacation and liked it so much I ordered a 2nd in a different colour! It's thin, yet cosy, and I love the fit - not too tight, not too loose. Rated 5 out of 5 by SoldOnMerino from Pretty Top I love the Cool Lite fabric of this pretty top. It's perfect for warmer weather and merino lovers like myself. The cap sleeve adds a nice feminine touch and fits very well. Rated 4 out of 5 by Retiredteacher from Nice T-shirt This t-shirt is a nice color, and looks attractive. The cap sleeves make it look feminine. Rated 5 out of 5 by MoniqueB from Love that Tshirt !!! Love the design and the print. Feels light that is perfect for hot summer days . Rated 5 out of 5 by Alice from Great feeling! Nice material. Keep me cool. Non sticky and non smelly. Worth the price.